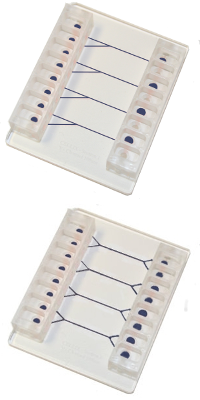 The VenaDeltaY1™ and VenaDeltaY2™ biochips contain branching microchannels for dual flow / dual injection of samples. Ideal for studying chemotactic gradients, dual flow, multilaminar flow & diffusion. Disposable plastic biochips for studying chemotactic gradients, dual flow, multilaminar flow & diffusion. Suitable for brightfield, phase contrast and fluorescent microscopy. Suitable for cell-based assays with whole blood, primary cells, rare cells e.g. where samples are more difficult to retrieve or culture or only small sample volumes available. No assembly of the biochip is required unlike many standard perfusion chambers / flow chambers. No luer lock connections which increase dead volume. Cellix's biochips have a unique plug & play connection with tubing connections which are autoclaveable and reuseable. Applications: chemotactic gradients, dual flow, multilaminar flow & diffusion.